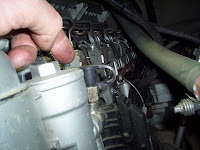 We experienced troubles trying to get the Mercedes MBE 900 Diesel Engine started again after it has run out of fuel. Originally we would have to pressurize the fuel tank and bleed the system at the fuel lines. Most of these engines come with a quick coupler right at the fuel filter housing. The 2005 and earlier models have to be fitted with the coupler, a kit is available from the dealer. The sender must be removed and tested with an ohm meter. We had some incidents on one of our C2 units running out of fuel prematurely. This tank has to be topped up with diesel and pumped continuously while a second person cranks over the engine. It works great and saves a lot of wear and tear on the starter! I have a 2004 "Freightliner Step Van with a Mercedes MBE 900 Engine. there is no fuel water separator and no pump to prime the system , if run dry. I have changed the fuel filter many times (110,000 miles) and never have a problem starting the engine. I am wondering how the system gets rid of the air. We use the bleeder system pictured in this post. It's the best way to bleed air, before we were cranking the engine over and over to start. The adapter is available from the dealer if you are interested in going that route. I'm surprised you didn't have problems starting before after servicing fuel filters. The only way to get rid of air is to push the fuel through to the return line back to the fuel tank. I have a 94 gmc topkick with a cat3116 in it. My problem is that the fuel governor or something lets the engine run wide open.The rack is not stuck, and the fuel solenoid will shut off the engine when the key is turned off. All the linkages are ok. I have had the governor apart several times and checked springs, linkages ect. against a cat drawing of this governor,all seems ok.What could it be? Have you run into this problem before? 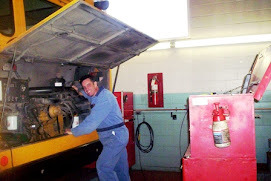 I am an MBE mechanic with G2 certification. The problem with hard starting is simply because of the unit pumps. My best advice is a can of Ether (just a wiff) *beware do not use with grid heaters* ..... but just a wiff while turning it over will provide enough rpm to successfully fill the high pressure lines to the injectors. This is only needed if you run the system out of fuel. The high pressure lines stay full due to checkvalves during filter changes, as long as you dont get an air bubble in the system during service you should have no trouble starting. can you tell me where to get the female adapter for the fuel pressure on the mercedes C2 bus. I have one that will not start after replacing the filters. can you tell me where to get the female adapter for the tank sprayer so that i can pressure up the fuel system. I have one that is not starting after filter changes. The female adapter is available at the Mercedes dealer. In our case it's "Cullen Diesel" in town. We had some buses that came equipped and some that didn't, it's an option by the looks of it and a very handy one to have. Is the coupler that attaches to the hose just a air chuck type quick disconnect? Yes it is. A basic quick disconnect set up. 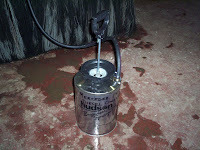 PRESSURING THE UNIT AT FITTING MENTIONED DIDNT WORK, I MADE THE TANK PUMP/35PSI. REMOVING FUEL FILTER GAVE A WOOSH OF AIR. TWO TANK SYSTEM ON A ,06 FRIEGHTLINER, BE NICE TO SEE A SYSTEM PIC.ANY IDEAS? We had the same problem and it turned out to be the overflow valve which is mounted in the head between 5 and 6 injector on the return fuel side. If it does not you get excessive air in the fuel system. To test this out you remove the return fuel line at the filter hsg and run another line into a bucket. You should not get more than 1.6 liters of fuel flow (close to 1 quart). We got over 3 liters so the overflow valve was stuck open or letting too much fuel back to the tank. And of course the engine is idling while you're checking the flow volume. I have a 2008 Thomas C-2's with the MBE900 that keeps losing fuel pressure. Had to bleed system twice now in one week by cracking injector lines while cranking engine. pressure valve between #"s 5 and 6 injectors was just replaced. we go a week before it loses pressure. any ideas. 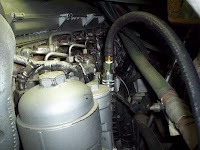 Check out the overflow valve (get one from Detroit Dealer) that is installed in the fuel return line around #5 injector. If it does not maintain 65 psi a hard start will occur. you've already changed the over flow valve so next hook up to the detroit software and check out the injectors doing an idle speed balance test. This will tell you if the injectors are using too much or too little fuel to keep injection balanced. Also check the fuel pressure from the gear transfer pump by removing the fuel sensor behind the left front engine lifting bracket and installing a guage. Pressure needs to be around 65 psi when idling. Check for any leaks on return side. Ive changed the fuel pump with new, the overflow check valve, the inlet and return check valves, it has a new inlet heater. Still hard to start in the mornings. Cranks right up after the initial hard start up. I give up!!!! We've had the same issue though I've installed a new fuel pump, overflow check valve, inlet and return check valves, and a new inlet heater. Still hard to start in the mornings. Starts fine after that.